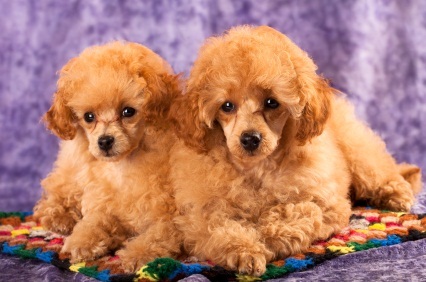 It's nice to have puppy dogs 101 information before you purchase your poodle puppy, and learn what to expect when that little ball of cuteness arrives home. Puppies should begin their socialization as soon as you bring them home. It's essential to expose them to people and other animals at this age to foster positive skills in them. This helps promote a socially adept, not shy or timid, dog. Your puppy won't be afraid of new things, animals or people and will grow up well adjusted without being timid, afraid or shy if he is exposed to a variety of situations, people and fellow furry friends. Make sure to keep your new puppy away from other dogs until he has had all his vaccinations. 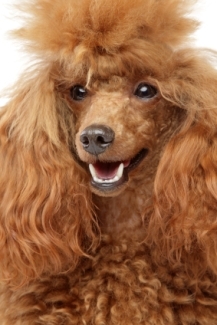 Puppy dogs 101 states that poodle puppies will chew as they teeth. It's normal and you can expect it close to 4 months old. Keep items, like shoes, you don't want chewed up, out of his reach. Buy a chew toy, or two. If he chews something he shouldn't, train him that it is not okay to do that. He'll learn quickly. As for how to train a puppy and housebreaking a puppy, potty training puppies can be done in different ways. Pick a way that will be the least stressful for both you and her. Your pup will need potty training. Start this the day she comes home. Poodles learn quickly, Holly did, so be consistent with daily training. Puppies can't control their bladders very well at young ages, so you may want to overlook a few accidents in the beginning. Remember to train them lovingly and gently. Never rub their nose in it. Poodles, like all dogs, love to ride in the car. It's okay to take your puppy for car rides early on. He'll get used to car rides. Keep in mind he's just a baby and may suffer from motion sickness. Be sure to have old towels or paper towels with you to cover the seats! Don't feed him before the car trip and keep his first few rides around the block. Make sure she's secured in a car restraint in the back seat, don't hold her on your lap. Although dogs love to hang their heads out the window, it should be discouraged if possible. They can get objects in their eyes and ears that fly up from the road in a moving car. Enjoy the new addition to the family who will be a loving bundle of joy as he goes through his doggie life with you.